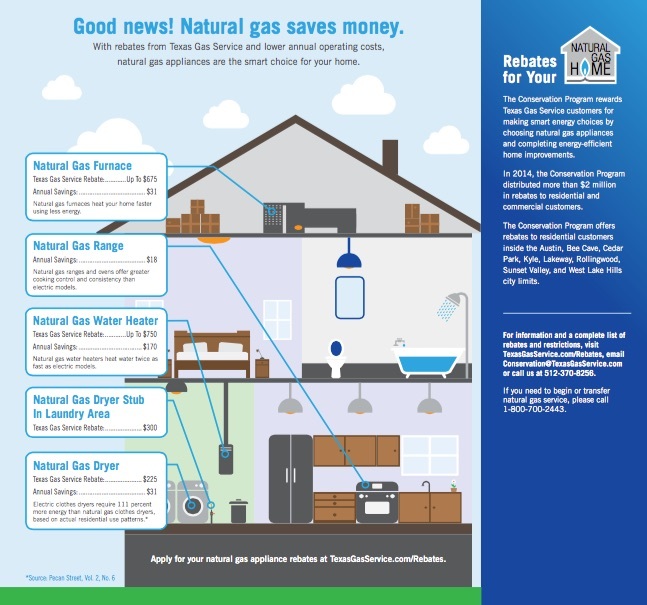 Did you know there are natural gas rebates in many Central Texas areas from Texas Gas Service for installing natural gas appliances in your home? In 2014, the Conservation Program distributed more than $2 million in rebates to residential and commercial customers., rewarding patrons for smart energy choices and for completing energy-efficient home improvements. In addition to conservation, studies indicate gas service carries lower annual operating costs. Homes serviced by Texas Gas Service within the city limits of Austin, Sunset Valley, Cedar Park, Kyle, Rollingwood and West Lake Hills city limits are eligible to apply for rebates on energy-efficient natural gas appliances. Take a look at what may be available and download the full brochure: Homeowner Brochure for Gas Rebates.